Charts are a wonderful visual aid for those who get lost using textual instructions. They allow you to see intricate stitch patterns in a new way and make it easier to document your progress as you work along. The majority of lace knitting projects will involve a chart or two, regardless of their skill level. Many lace patterns are comprised solely of charted instructions. Either way, chart reading is a valuable skill for any knitter to possess. If knitting a piece of lace in the round, you will read the chart from right to left on every round. For instance, on the chart below, you will notice that all of the rounds are marked with numbers on the right hand side. This is uaually an indication that you will begin each round on that side. The first and second round have you knit every stitch. In round 3, you would knit 2 stitches, knit two stitches together, yarn over, knit 2 stitches, knit two together, and yarn over to complete the repeat. Next you would begin at the right side of round 4 and so on. When knitting a project flat, you knit back and forth, turning your work each time you finish a row. The numbered rows now alternate between the left and right hand sides of the chart. This indicates that you would begin with row 1, reading it from right to left. When you finish row 1 and turn your work to begin row 2, you might begin from the left side of the chart where the number “2” is. Working from the opposite side of the chart compensates for the fact that you are now working on the “wrong” side of your knitting. You will also find that the legend for the stitches is worked differently at this point as well. 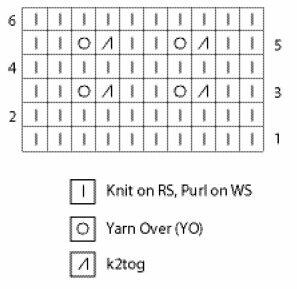 Since you will be working on both sides of the knitting, a symbol on the chart may have a different meaning depending on which row you are completing. For example, the vertical dash will be knitted on the odd rows (the right side) and purled on the even rows (the wrong side). There are a few symbols you may encounter that could be confusing. Many lace patterns involve various decreases to eliminate stitches and yarn overs to restore stitches. There may be rows, however, where you have fewer stitches than previous or future rows. When this happens, you will see some boxes on the chart that are blacked out – you needn’t do anything in your knitting when you see one. In the example row below, you would simply knit 8 stitches. In the next row, these blanks may be replaced by yarn overs restoring the stitch count to 10. 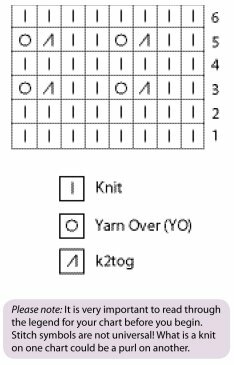 Another peculiarity you will find when knitting lace charts are indications for repeating a certain section of stitches. Often, your chosen project will feature a repeat section that is duplicated a specific number of times to create a desired width or length. Instead of creating a chart that is unreasonably wide, instructions for repeating certain sections may be listed. As you are working the repeat sections, place a marker each time you begin the repeated stitches. This is an essential step in keeping your knitting organized. It will allow you to count your stitches effortlessly by presenting them in small groups and will help you quickly identify mistakes. Repeated sections are most often bounded by dark vertical lines (as shown above) to help emphasize and define the group of stitches that will be repeated. Many charts can be difficult to see and read because of their size of abundance of graphic symbols. For that reason, we offer the following tips to keep you reading charts for ages! Try enlarging the chart on a photocopier. Most conventional machines offer the option of increasing the size of the print anywhere from 1% to 100%. Use a highlighter to mark every other row. This will make the rows stand out better and will make it easier on your eyes to return to your chart after a break. This also helps identify right side versus wrong side rows. is an invaluable, portable to help you stay on track with your lace chart wherever your knitting takes you. With various magnets and a magnetic backboard, it holds your pattern in place and allows you to block off the rows of the chart that you have already completed. This entry was posted in Lace, Pattern Reading, View All by Knit Picks Tutorials. Bookmark the permalink.